You can find any kind of weather prediction on the Internet if you only look hard enough. 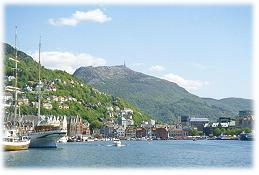 5 days weather forecast + online web camera overlooking Bergen, positioned on Mount Fløyen where the conference dinner will be. Also includes current temperature. The Norwegian Institute of Meteorology, 4 days forecast, Bergen is in the row labeled "Vest-Norge sør for Stadt". Euroseek, has nice graphical view. Web camera overlooking Bergen, on Mount Ulriken highest mountain close to Bergen. Another web camera in the harbor, if you only see clouds then we are currently having fog.